Product prices and availability are accurate as of 2019-04-05 16:25:31 UTC and are subject to change. Any price and availability information displayed on http://www.amazon.co.uk/ at the time of purchase will apply to the purchase of this product. Welcome to a world where children and adult run everything. In this world, everything is a game and nothing is boring. A surprising and fantastic scenario is waiting for you! Dimension: 17.5 x 3.5 X 11cm (L x W x H ). Package Dimension: 23 x6 x 4.5cm (L x W x H). Charging Time: About 30 minutes. First,the light will be on and the propeller of the plane is going to turn when you open the switch under the helicopter from right to left. Note: Be careful your hand. Please hold the bottom bracket of the helicopter, don't touch the propeller. Then, release it. The height of the helicopter could be controlled by induction. But your hands do not touch the propeller of helicopter, and keep helicopter far from the ground. You could turn off and open the switch, it will fly again,if the helicopter falls on the ground accidentally. You could also control it following the pictures' instruction of the packaging. 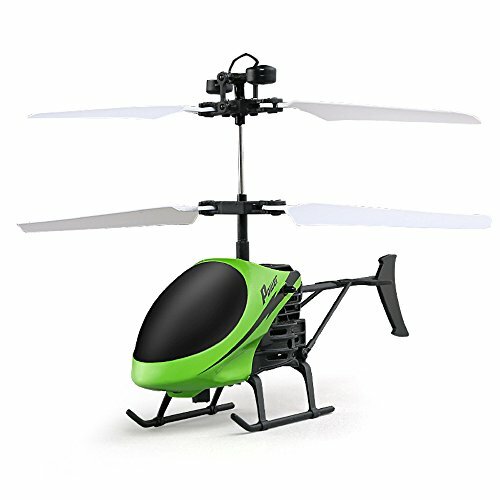 Eazy to use product startup 3 seconds automatic take off,induction flight press the remote control buttons,start/stop flying. Body Material: ABS Plastic. Dimension: 17.5 x 3.5 X 11cm (L x W x H ). Package Dimension: 23 x6 x 4.5cm (L x W x H). Flight Time: Approx. 6-8 minutes. SOLD ONLY BY LISHY: Recently some fake sellers use illegal way to sell our "Lishy" brand products, we do not authorize other sellers to sell our products on amazon.Click [Lishy] browse in our store, 90% products on sale with a low worthy price!